Are you longing for the consistency of snickerdoodles? But maybe wanting some different flavors? You'll want to give this recipe a try because these Pumpkin Spice Doodles just might be what you're looking for. 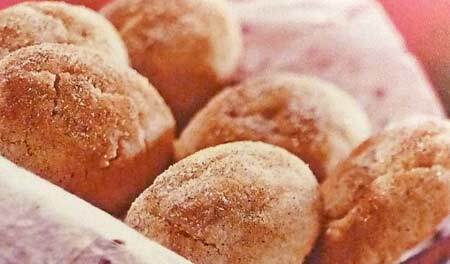 Unlike traditional snickerdoodle cookies which are rolled in a sugar and cinnamon mixture before baking, these spice doodle cookies are rolled in the aromatic combination of sugar and pumpkin pie spice for a unique twist. Pumpkin Pie Spice , which can be found in the spice section of your local super market, is a combination of the amazing flavors of cinnamon, ginger, nutmeg and allspice. So they're kind of like snickerdoodles, but with much more action on your taste buds. They're perfect anytime you want something a little different, but especially ideal for Halloween, Thanksgiving and/or Christmas dessert table. Try these kid-friendly treats the next time your baking for children - and be sure to enlist their help when it comes to rolling the cookie balls and coating them in the sugar and pumpkin pie spice mixture! Line your baking sheets with parchment paper or silicone liners or lightly grease, and set aside. In a large mixing bowl, beat butter and shortening with an electric mixer on medium to high speed for 30 seconds. Add the 1 cup sugar, baking powder and salt and beat until combined. Beat in egg and vanilla until mixed. Gradually beat in flour with mixer and stir in any remaining flour, if necessary. Cover and chill dough about 1 hour or until it is easier to handle. In a small bowl, stir together the 2 tablespoons sugar and pumpkin pie spice. Shape cookie dough into 1-inch balls by rolling between your palms. Roll balls sugar and pumpkin pie spice mixture to coat evenly. Place balls about 2 inches apart on prepared cookie sheets. Bake for 10 to 11 minutes, or until edges are lightly golden. Remove from oven and allow to cool for a minute on the pan and then transfer to wire racks to cool completely. This recipe makes about 40 Pumpkin Spice Doodles cookies.